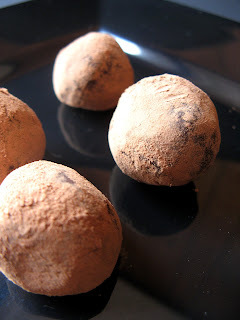 Have you ever made chocolate truffles? coatings: cocoa powder, coconut, chopped nuts, etc. note: You can easily double the recipe; this one make about 15 small truffles, but maybe even more if you don’t keep tasting the truffle mixture every time you pass the fridge :D.
Place your chocolate into a medium mixing bowl and set aside. Pour the heave cream into a microwave safe measuring cup, add the sugar and butter and heat to boil. Keep an eye on it or it will boil over. Pour the hot cream over the chocolate and let stand for 3 – 5 minutes. Whisk until smooth. Add your flavoring and whisk again. Go ahead, taste it! Add more flavoring to your likings. 🙂 Place the bowl in the refrigerator for 3 hrs or overnight, so the mixture can set. 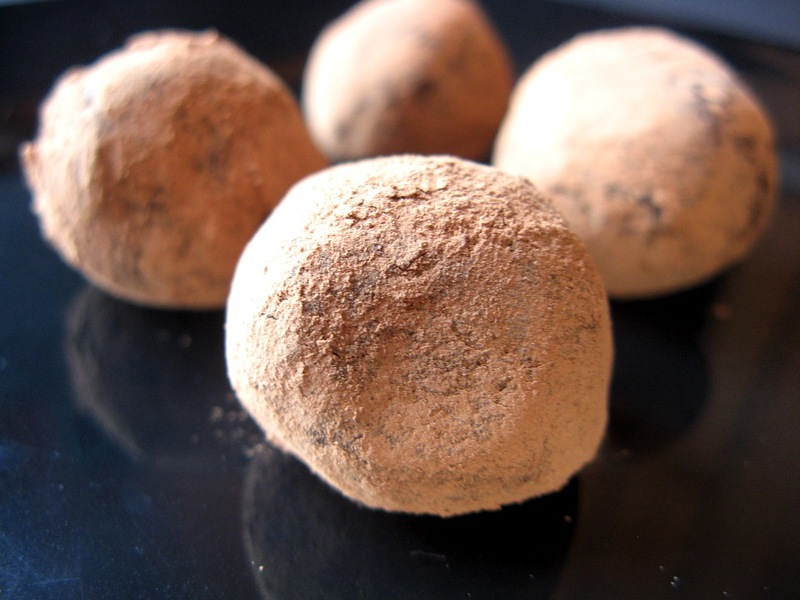 Scoop the truffle mixture with a teaspoon, roll into a ball shape between the palms of your hands. Next, roll in the desired coating: cocoa powder, shaved coconut, powdered sugar, finely chopped nuts, sprinkles etc. love truffles and these look amazing!! Oooh, this is the perfect Valentine's Day treat…I love all the deliciousness from so few ingredients! YUM. Hope you had a wonderful day! It always has amazed me how simple truffles are to make. They are the ultimate chocolate treat. These look divine! Oh these look delicious!! I love truffles rolled in cocoa. I try my best 😉 Thank you for stopping by! I love making truffles, they are such a treat! I bet this was a fun family project. Can't wait until my Anna is old enough to help me out with this. And you didn't give your little one even a little bite? 😉 Hehe, just kidding of course. Hope you had a wonderful Valentine's Day! These truffles look divine! Perfect for the special celebrations. Thanks for stopping by my blog and leaving a comment. You have some serious sweet treats on here. Thank you for visiting CCS! These sound divine. Although I do have to watch my fat and sugar intake… once in a while I treat myself. I will be trying these. I have never bought liquor before. Is it in small bottles at the liquor store or can you get some flavors in small bottles in the baking section of a store? Happy Valentine's Day. And thank you for stopping by!! I adore truffles and these look wonderful! Happy Sweet Valentines to you, too! I love truffles and they are surprisingly easy to make…..but they taste like there is a TON of effort! Yours are stunning! Yum, these look good. Pretty too! Anna, those truffles are perfect for the V-day and any other day as well. ooh, after reading this my mind is reeling of all the different flavors you can make these. I do have a lot of liqueurs on hand! The Frangelico sounds like the perfect flavor to start with though! Thanks for sharing this delicious truffle recipe-yum! Happy Valentine's day! Thanks so much for stopping by. I'm happy to have another delicious blog to follow. I will certainly do your truffles. The recipe sounds delicious. My husband's big object to truffles is too much butter. Your's depend on the chocolate rather than an excess of butter. And the recipe below? I can't wait to try that. I'll be back with a big glass of milk to read more. So nice to meet you! I appreciate you following my blog and I am now following you. These truffles looks delicious. Wishing you and yours a Happy Valentine's Day! All I can say is I am drooling! Truffles are my all time fav! I love when the cooking projects are something the kids can do! Have a wonderful Valentine's Day!